New Zealand is one of the best countries in the world to explore by campervan! This country boasts vast areas of outstanding natural beauty; and the best way to see it all is to travel by campervan. If you are flying into the country it could not be easier to arrange. Just book your motorhome rentals, recreational vehicles (RV) rental and campervan hire Auckland Airport in advance; and your home for the duration of your holiday will be ready and waiting for you when you arrive. Find the best deal on leading Auckland Airport campervan hire with Maui Motorhomes, Apollo Campervans, United Motorhomes and Britz Campervans; as well as many smaller motorhome rentals companies. Even if you have never camped or caravanned before, have no fear! The staff at campervan rental Auckland Airport branches are specialists in their field and will explain all the ins and outs of this exciting mode of transport that will get you from one destination to the next in comfort and style on your New Zealand holiday. What to expect from Motorhome hire at Auckland Airport? Campervans or motorhomes come in all shapes and sizes and there is definitely one just tailor-made for you! You can choose anything from a romantic two-berth van with cooking facilities; to a luxury home on wheels with all the home comforts for up to 6 people to enjoy. The larger luxury vehicles even come equipped with a toilet, shower and power-point hook-up, as well as TV and all you need to cook up a storm. Motorhome rental at Auckland Airport will have you on your way to adventure in no time; all you need to do is pick up some supplies. New Zealand has dozens of brilliant holiday parks where you can spend your nights. Taking your home along with you means that you never have to waste precious time back-tracking to a base camp. If you are a couple on a strict budget, campervan hire is just the thing to stretch your dollars. You can choose a budget campervan rental from Auckland Airport and with a little forward planning you can plot your route to make use of the large network of New Zealand Holiday Parks all around the country, while having cooking facilities means you can spend less on eating out – this way you will have more to spend on some of the amazing adventure sports available en route. Where to go in your Auckland Airport Campervan Hire? The whole of New Zealand is in your pocket when you pick up an Auckland Airport campervan hire! For spectacular coastal scenery travel north to the beautiful Bay of Islands where there are many places to stop overnight; think brilliant scenery, stunning beaches and rivers – all you need for a coastal holiday. 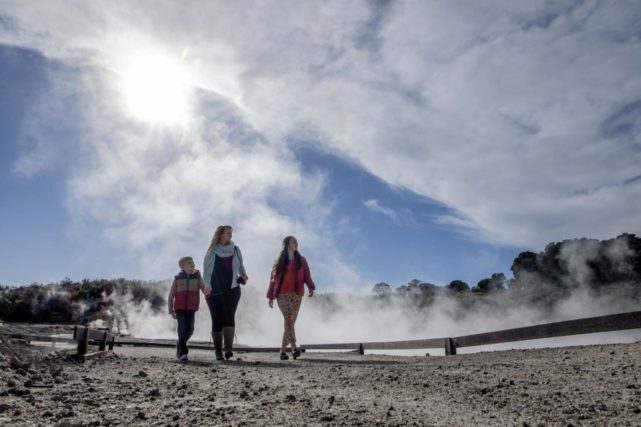 Tour all the sights of Auckland before heading south to Rotorua to see the geysers and go trout fishing on Lake Rotorua. Then head for Taupo for an adrenaline rush as you shoot the rapids in a jet-boat. Your Auckland Airport motorhome rental does not confine you to North Island; you can drive your campervan onto the ferry at Wellington and be in South Island in 3 hours after enjoying one of the most picturesque ferry journeys in the world. It is even possible to drop-off your campervan hire in Christchurch on the South Island, after exploring the West Coast, Queenstown and Milford Sound; if you do not have the time to drive back to Auckland at the end of your amazing New Zealand Campervan holiday.